This article is for Mesma clients and describes how you can set-up Evaluate to produce an easy to read self-assessment report. An exemplar report has been provided to our further education and skills clients to help users simply the activity of self-assessment. You can find this in Store in the Mesma Resources folder. 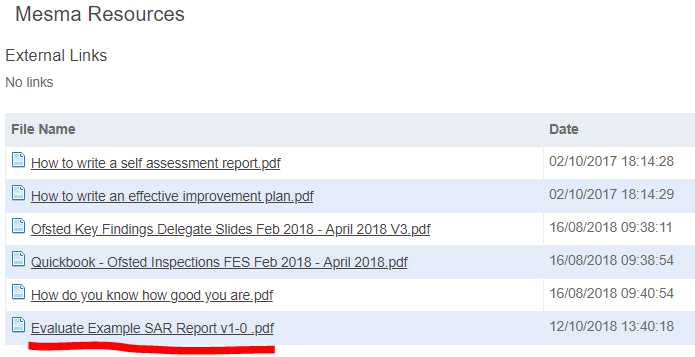 The RAG report is created by using the SWOT feature in Evaluate and will allow you to produce a RAG report which shows the proportion of grades you have allocated across the key questions by aspect. For example, below you can see Outcomes for Learners has primarily been graded as good with some outstanding. And, the SWOT feature titles have been changed as seen below. Remove the evaluative statement page which then leaves you with SWOT and Grade pages. 2. Change the titles in the SWOT screen. If you have any questions please do not hesitate to chat.